This purple butterfly bush is a new plant that has proven itself with its drought and deer resistant nature. It is a hardy plant that is characterized by lavish lavender-blue flowers that are not only unique but also long lasting. The rich purple flowers are distinctively shaped and have an amethyst tone with just a tiny tinge of yellowish orange at the center. Your garden will be lit up for most of the year as these flowers stay in bloom for 5 months. The pugster amethyst, aptly named for its resemblance to the pug, is short, compact, and with a dwarf frame. It only grows up to 24” high and 26” wide. The pugster has thick and sturdy stems which are great for supporting the heavy flowers. It is a continuous bloomer from early summer through to fall and survives through winter. 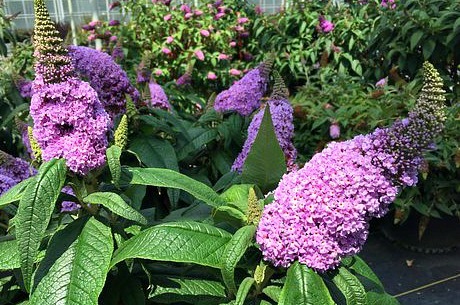 This purple butterfly bush is a deciduous dwarf flowering shrub with green foliage and a mounded growth tendency. It requires sun and easily blooms on new wood. Plant it on soil with good drainage, although it has no strict soil preferences and will do well even on averagely fertile soils. Caring for the dwarf butterfly bush is fairly easy as it has little maintenance requirements. It requires little watering or pruning due to its short stature. It’s long blooming period makes it a perfect plant for the sunny spots in your landscape. It can be used as a border plant to add a pop of color in your fencing or as a potted plant to put closer to the house. You can also choose to plant it as a focal point feature in your flower garden or as groundcover. It attracts butterflies and bees which find it hard to resist its honey fragrant flowers. It is however restricted and cannot be shipped to Oregon. Also order the Pugster Periwinkle Butterfly Bush and the Pugster Blue Butterfly Bush. Pugster Amethyst Butterfly Bush is grown in a quart size pot. Orders going to CA or AZ may be bare rooted before being prepped for shipping. This plant cannot ship to OR.